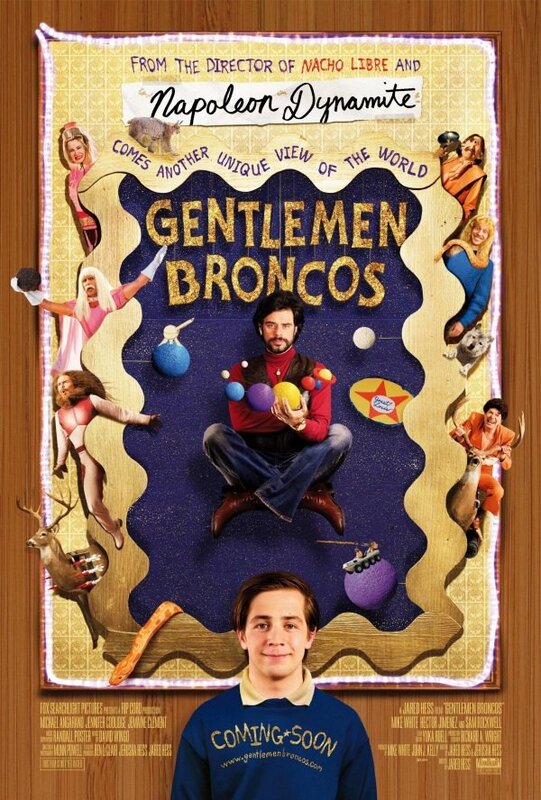 There's a quirk explosion happening over at Fox Searclight, which has just debuted the poster for Gentlemen Broncos, the new film from Napoleon Dynamite director Jared Hess. Not only does it have that handmade Napoleon Dynamite aesthetic, not only does it feature Flight of the Conchords star Jemaine Clement wearing silly facial hair, not only does one of the side characters appear to be riding a deer, but to top it all off, it's coming from Fox Searchlight, the company that made quirk a household name with movies like Little Miss Sunshine and Juno. And yet, I have to admit-- I'm looking forward to this one. First of all, the plot sounds hilarious-- a teenager (Michael Anganaro) realizes his favorite sci-fi author (Clement) has ripped him off for his new novel, and the hilarious adventures ensue from there. Sure, if it's nothing but a Napoleon Dynamite rehash, it'll be worthless. But with a third Flight of the Conchords season nowhere in sight, I'll take it. Check the poster below. A trailer will be hitting the web tomorrow, to maybe give us an idea of where this falls between quirky and intolerable.